Those trying to heal our nations dying health care system have compromised over and over in the last 6 months. Now that even a weak version of the public option is in peril, it’s time for the appeasement to stop and the pitchforks to come out. It is time for our line in the sand: you can go this far…and no further! That the coun­try needs to reform its health care sys­tem is painfully obvious. At least 47 mil­lion Amer­i­cans have no med­ical cov­er­age, 75 million are underinsured with skeleton plans, and 86.7 mil­lion Amer­i­cans have been unin­sured for at least 6 months over last two years. There has been a dra­matic rise increase in the unin­sured rate in every state. 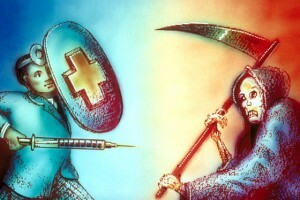 Lack of health care cov­er­age caused 45,000 deaths per year. Health care pre­mi­ums shot up more than 90% between 2000 and 2007, while the prof­its of the 10 largest insur­ers increased 428 per­cent over the same period. With­out real reform, there will be a 94% increase in health insur­ance pre­mi­ums by 2020. Har­vard researchers say 62% of all per­sonal bank­rupt­cies in the US were caused by health problems—and 78% of those fil­ers had insur­ance A good video analy­sis of the sci­en­tific rea­sons for reform can be found here. In the beginning, there was the idea of fully socialized health care, an idea that we could have a highly successful and cost effective system like Norway or Sweden. Universal coverage from birth to death, world class care, less expensive, and rewards like some of the world’s highest life expectancies and lowest rates of preventable conditions. But in the spirit of bipartisanship, we compromised. Then a single payer system became the centerpiece of the reform effort, also known as Medicare-For-All. This would have ensured that every American would have access to medical coverage, and would still be much less expensive, cutting 31% of the costs of our current system just by eliminating administrative waste. Further savings would have been generated by the need to stop advertising, private cost-benefit analyses, etc. We already have Medicare for everyone over 65 and it is a very popular program. So a strong, robust public option was introduced. 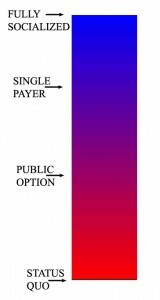 Originally, the public option was designed to cover 150 million Americans. Since 94 percent of statewide insurance markets are highly concentrated and offer only a couple options, this would have provided some serious competition to their profiteering and ethical abuses. The most effective safeguards were watered down until this plan would only cover about 50 million Americans. This moderate form of the public health insurance option still would have forced the corporations to clean up their act though, and Americans from around the country would have had the freedom to participate in the public plan if they wanted to. The current version of the public option is neither strong nor robust. It will only attract 6 million Americans by 2019, and only then under rare circumstances that are often beyond their control. It takes away the freedom of people to enroll if they want to and guarantees rates will be higher than private insurance, whose rates will still not be regulated. This is the version in HR3962, the bill passed last Saturday in the US House of Representatives in a very close vote. Despite how weak it is odds are that it STILL will not pass in the US Senate. Without a public option that is accessible to folks, there is going to be a huge public backlash. But hey, conservative Democrats and Republicans who are corrupt with corporate campaign contributions can’t have that, so let’s compromise again! How about stripping off the public option, taking out all of the parts of the bill that regulate the unethical practices of the corporations, and let’s just GIVE them $800 billion instead. Just directly give it to them. Here ya go, this is what you want, this is what the conservatives have been fighting for, take it. No strings, just pure profit, and you should certainly make sure the vast majority of it goes directly into the pockets of your CEOs too, after all 1/3rd of all the pay in America certainly isn’t enough, now is it? How about we drop all taxes for anyone making over $1,000,000 per year too? Would you be happy then? I don’t know about you, but I am sick of compromise after compromise after compromise. There comes a certain point where compromise becomes futile and appeasement and that threshold was passed long ago. It’s time to fight back folks. Get your pitchforks. We have to remember what we’re fighting for: literally the lives of our people. A strong, robust public option is the minimal amount of change that can be called effective real reform, and at least one Senator (Bernie Sanders) promises to filibuster any bill that falls short of that. It’s time to draw a line the sand: this far, and no further! There are many health problems related to different professions. An employee, at the time of employment, is briefed about most of the health problems related to their employment.